The FIE Compression Testing Machine Incorporates design features to enable high accuracy testing with economy, speed & versatility. Motor driven geared shafts for quick effortless adjustment of cross-head-to facilitate rapid fixing of test specimen. 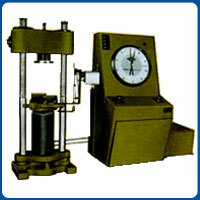 FIE Compression Testing Machine is designed for test materials under compression bending, transverse and shear loads. Hardness test on metals can also be conducted. Operation of the machines is by hydraulic transmission of load from the test specimen to separately housed load indicator. The hydraulic system is ideal since it replaces transmission of load through levers and knife edges, which are prone to wear and damage due to shock on rupture of test pieces. Load is applied by a hydrostatically lubricated ram. Main cylinder pressure is transmitted to the cylinder of the pendulum dynamometer system housed in the control panel. The cylinder of the dynamometer is also of self-lubricating design. The piston of the dynamometer is constantly rotated to eliminate friction. The load transmitted to the cylinder of the dynamometer is transferred through a lever system to a pendulum. Displacement of the pendulum actuates the rack and pinion mechanism which operates the load indicator pointer and the autographic recorder. The deflection of the pendulum represent the absolute load applied on the test specimen. This consists of a hydraulmic cylinder and a table coupled with the ram of hydraulic cylinder, mounted on robust base. The cylinder and the ram are individually lapped to eliminate friction. The cross-head is connected to two screwed columns and is driven by a motor, for rapid adjustment of test height. Hand operated wheels are used to control the flow to and from the hydraulic cylinder. The regulation of oil flow is infinitely variable incorporated in the hydraulic system is a regulating valve which maintains a practically constant rate of table movement. AII FIE Compression Testing Machines are closely controlled for sensitivity, accuracy and calibration during every stage of manufacture. Every machine is then calibrated over each of its measuring ranges in accordance with the procedure laid down in BS : 1610 : Part 1 :1992 and IS 1828.